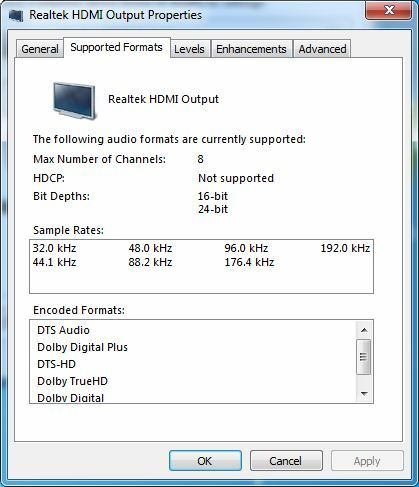 When I connect the HDMI cable from my Samsung desktop with Windows 7, it seems that the video portion is not working but there is no issue with the audio. There is no problem with the cable as it works fine with other computers. Please help me on this. You should check for any issue regarding the PC's video driver and card slots. Bring another HDMI cable and check if it works fine. 2. Click on the "Control Panel"
3. With the Control Panel in "Control Panel Home" view please click on "Hardware and Sound". 4. Where it says "Sound" in green letters there are three options below that are in blue click on "Manage Audio Devices"
5. This will bring up a window labeled "Sound"
6. On the "Playback" tab there is listed the sound options available to you. One should read "Digital Output Device (HDMI)" Click on that. 7. There should now be a check mark on that option. 8. The Sound should then play through your HDMI hookups to the TV. You need to update your drivers if incase the above step does not work. Its not a big problem . There is many video in mp4 is not working in other program . first you should to convert your video in a suitable program . Then try it again .